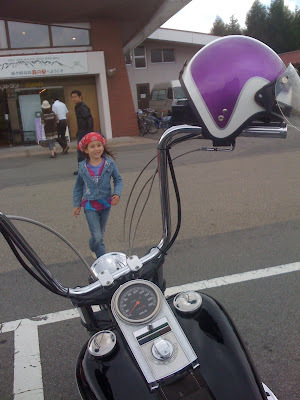 My little girl is becoming a biker even earlier than I expected. 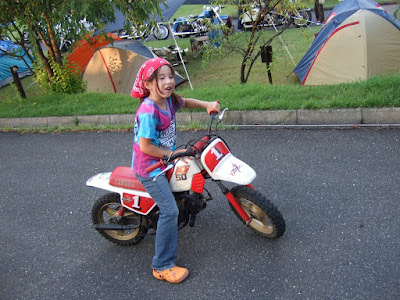 I’ve tried to expose my six-year-old daughter, Lin, to bikes and biker culture as much as possible, and have been taking her on rides on the back of my bike since she was four. 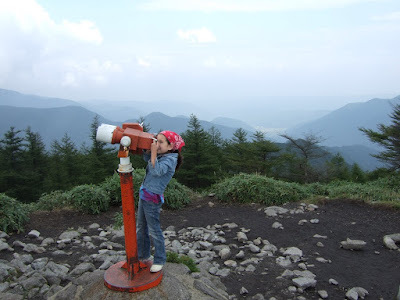 We’ve been building up to this for a while, with our short Father’s Day ride up Yabitsu pass and our camping trip to Nishi-Tanzawa, and last weekend we finally made the next big step: Lin’s first long-distance touring and biker rally at Matsumoto Camp. As I’ve mentioned before, Matsumoto Camp is one of my favorite rallies. 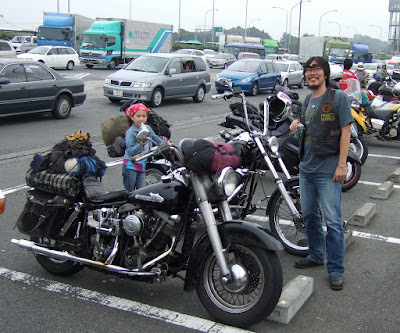 It’s smaller than many, with only 100-300 bikes, but both the location and the regular core of bikers that shows up are just the way I like them, and I thought it would be perfect for introducing Lin to the wider biker world. Unfortunately, most of the Takatsu-gumi group I usually ride with had other commitments, so only YOS was able to ride with us this time. The weather forecast had been calling for rain all weekend, but I was pretty sure my usual understanding with the rain gods combined with Lin’s luck with these things would push away those clouds. 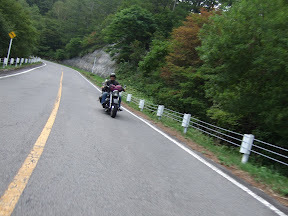 Sure enough, the rain stopped by the time we woke up, and we headed out to meet YOS at Ishikawa under a gradually brightening gray sky, and by the time we got to Futaba, the halfway point of the expressway trip, we were riding under clear blue skies. This was Lin’s first long expressway trip, and I wasn’t sure how she would deal with it, but beyond a few requests to stop and rest, she was fine. Of course, once we left the expressway and headed up the Venus Line into the mountains, she was more than fine. I let her have the camera, and she got some good riding shots of YOS on his shovelhead, and even took a little video from the back of the bike. We stopped for lunch, but Lin couldn’t wait to get back on the bike, and left most of her soba uneaten. We rolled into Matsumoto Camp by mid-afternoon, finished greeting all our friends, and sat down to relax just as the downpour started. But who minds the rain once you’re safely under a tarp? It let up soon enough, and we went exploring around some trails near the campground, and then Lin went off to play with some of the other kids that local bikers had brought along with them. I went off to relax with beer and conversation, confident that I had successfully shown Lin how fun rallies can be, and that I could be sure she’d want to go to the next one too. What I hadn’t anticipated was that Lin was about to take the next step toward bikerhood. 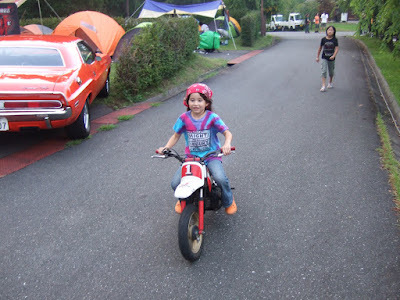 The Heaven & Hell MC, who host the rally, had brought along a 50cc pocket bike to patrol the campground and run quick errands, but they were letting the bigger kids try it out when they didn’t need it. 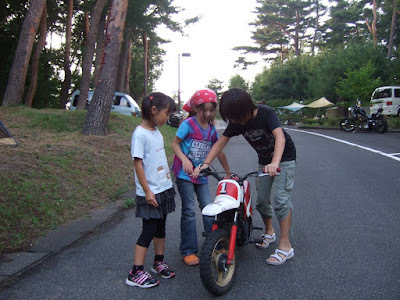 One of the older girls showed Lin how to work the throttle, and after a few tries, she got the hang of it. She and the other kids took turns on the bike for hours, and then started again first thing the next morning. By the end of it, she was riding like a pro. It took me years on the road to learn to ride that naturally. Not bad for a kindergartener, huh? So not only has Lin learned the fun of rallies, she understands the joy of riding as well. It’s too bad she’ll have to wait another ten years before she can get a license, but until then, it means I get a lot of biker-daughter quality time. 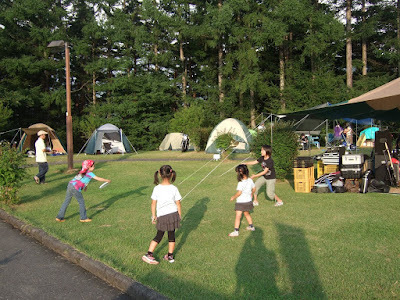 One thing I love about rallies in Japan is the moment of arrival at the campsite, when the bikers you know all yell out your name and rush up to shake your hand and welcome you. People you’ve maybe only met once before, people you look forward to seeing at every rally, people you haven’t seen in a year or more, bikers of all ages and from all over the country who rode all the way there to see each other—everyone is expressing the same feelings. There’s something we share that can’t be easily articulated—the joy that we’ve reached a place where like-minded people can gather, a place where bikers can be bikers. It’s more than just camaraderie; it’s true brotherhood. I rode up to the Vibes Meeting Harley rally in Yamagata this weekend, and some friends from Toyama brought me 鱒寿司（masu-zushi), a famous ekiben (train station bento). After getting drunk I went to thank them for the food and made an embarrassing careless mistake which also turned out to be a double pun. Instead of masu-zushi I said masu-zake, which is something else entirely. 鱒(masu – trout)寿司（zushi – sushi) is just as one would expect, trout on rice, whereas　升（masu – wooden cup)酒(zake -sake) is rice liquor served in a square wooden cup. I think my beer-addled brain went looking for a compound word starting in masu and grabbed the first thing it found. Then it failed to get an error message before output because sake can also mean　鮭(salmon) which is a pretty similar fish with a pretty similar taste. ..and the only thing I’ve got up is the meeting schedule for my run to a biker rally last week, and that’s in Japanese! I guess I need to put up a real post of some sort. Since it was Neal that did the linking, I might as well make this one language-related. 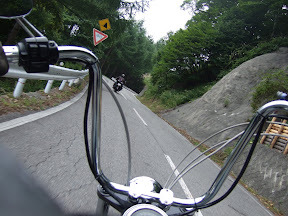 Last week we rode to the Brotherhoods Meeting, a biker rally in the mountains of Nagano Prefecture. Great riding and a great rally, but the name’s a little weird, and being one of the token Gaijin I got asked a lot of questions about it. Since the name is most often written in katakana(the Japanese syllabary) and with no spaces between words to help non-anglophones parse it, most of the Japanese bikers I talked to were under the impression that “hoods” was a separate word, and wanted to know what it meant. This also lead people to abbreviate the meeting as “BHM” (BrotherHoods Meeting) in email and BBS comments. Also , since the katakana rendering of “brotherhoods”, “burazafuzzu” in Hepburn romanization, contains the hu/fu sound(a bilabial sound somewhere between f and h), many people abbreviated it as “BFM”. Then there’s the matter of pluralizing the normally uncountable noun “brotherhood”. At first I thought this was just another non-native mistake, but it turns out that it’s intentional. This rally is a meeting of several different MCs(motorcycle clubs), i.e. several diffferent “brotherhoods”. Most of the bikers wore their “colors”, but it was understood that event was not the place for rivalries and feuds. It turns out that almost no one, even the Matsumoto MC that worked as staff for the meeting, was aware of what the name meant, and most people were really happy to have it finally explained to them. A few people said that understanding the name added to their understanding of the rally and gave it a deeper meaning for them. I guess I don’t really have a point to make here, except that it can be nice being a roving linguist biker sometimes.